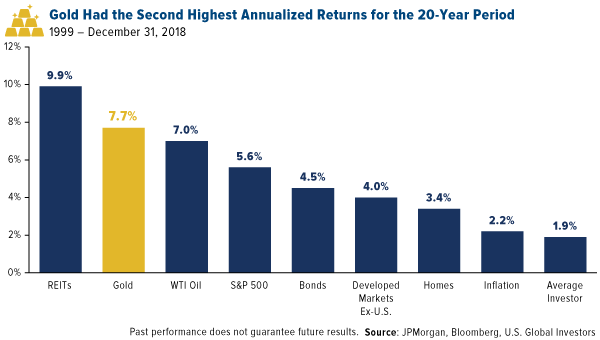 For the 20-year period ended December 31, 2018, gold as an asset class had the second best annualized returns at 7.7%. Only REITs did better at nearly 10%. If you drill down into Bridgewater’s SEC filing for the fourth quarter of 2018, you’ll find that Ray Dalio holds significant positions in gold across all tiers in the industry. The People’s Bank of China raised gold reserves to 60.62 million ounces, or 1,885 tonnes, in March as trade tensions continue with the U.S. Global central banks bought a net 51 tonnes of gold in February, the largest monthly increase since October 2018, according to the World Gold Council. Last week, the world got its first look ever at a black hole, one of those cosmic bodies so supermassive and powerful that not even light can escape its pull. These things literally destroy all matter that comes within their reach, making them the trash compactors of the universe. Gold, I’m happy to say, is not among those investments, despite all the negative press it sometimes gets. The evidence keeps rolling in that the yellow metal has historically been a wise investment. 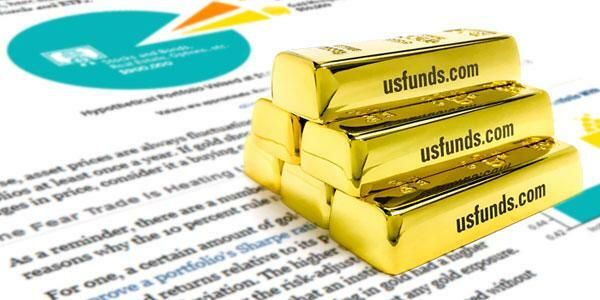 Because it has a negative correlation with the market, gold has helped investors diversify their portfolios and improve their risk-adjusted returns. Back in January, I shared several charts showing how the price of gold has beaten the market over several time periods, including the 21st century (so far). Take a look at the chart below, using data released last week by JPMorgan. For the 20-year period ended December 31, 2018, gold as an asset class had the second best annualized returns at 7.7 percent. Only REITs (real estate investment trusts) did better at nearly 10 percent. The S&P 500, by comparison, returned only 5.6 percent on an annualized basis, but that’s after it underwent two huge pullbacks that greatly impacted performance. Bonds—which include Treasuries, government agency bonds, corporate bonds and more—came in next at 4.5 percent. Not bad, considering the asset class has lower overall volatility and risk than equities. In last place is the “average investor” with a lackluster 1.9 percent. Surprised? You shouldn’t be. Quantitative analysis of investor behavior, conducted by research firm DALBUR, has shown time and again that everyday retail investors regularly lag the market, in good times and in bad, by an alarmingly wide margin. Last year they lost approximately 9.42 percent, or more than twice as much as the S&P did. This is due mainly to bad timing. Instead of taking a buy-and-hold approach and riding out short-term volatility, many investors tend to sell at the absolute worst time. And that’s often after missing the rally and buying at the peak. I shouldn’t have to tell you that this strategy, if it can be called that, is like a “black hole” for your money. Don’t get me wrong. Trading can be fun and sometimes very profitable. But it’s not investing. If you insist on trading, I believe it’s still crucial to maintain a sizeable allocation in high-quality stocks and bonds, exercise discipline and allow your investment to compound over time. And as always, I recommend the 10 Percent Golden Rule, which you can learn about by clicking here. Someone who follows the Golden Rule, with his own and other people’s money, is Ray Dalio, the billionaire founder of the world’s largest and most successful hedge fund firm, Bridgewater Associates. Last year the firm’s flagship Pure Alpha strategy delivered an incredible 14.6 percent gain (compared to “average” investors’ return of negative 9.42 percent, remember). This was not only Bridgewater’s best performance for the year since 2011, but it also helped keep Dalio atop the list of the most profitable hedge fund managers. If you drill down into Bridgewater’s SEC filing for the fourth quarter of 2018, you’ll find that Dalio holds significant positions in gold across all tiers in the industry. These positions include physical gold (via SPDR Gold Shares and the iShares Gold Trust), senior gold miners (Barrick Gold, Newmont Mining, Goldcorp, etc. ), junior gold miners (Yamana Gold, B2Gold, New Gold, etc.) 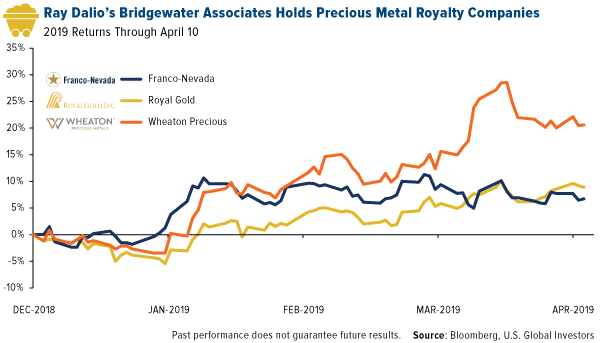 and gold royalty and streaming companies (Franco-Nevada, Wheaton Precious Metals and Royal Gold). As many of you know, I like to get access to the precious metal market with royalty companies. Back in January, Paradigm Capital showed that this small group of companies crushed all other tiers in the gold mining industry, delivering an unbelievable 16 percent in compound annual growth from 2004 to 2018. That’s Ray Dalio-caliber performance. Disparity in wealth, especially when accompanied by disparity in values, leads to increasing conflict and, in the government, that manifests itself in the form of populism of the left and populism of the right and often in revolutions of one sort or another. For that reason, I am worried what the next economic downturn will be like, especially as central banks have limited ability to reverse it and we have so much political polarity and populism. This definitely isn’t cheerful bedtime reading. I’m not asking you to agree with Dalio here—he doth protest too much, methinks—but if his thoughts resonate at all with you, I believe it’s even more reason to make sure you’re invested in gold. On a final note, the price of gold crossed above $1,300 an ounce again last week following news that China increased its gold holdings in March for the fourth straight month. The People’s Bank of China raised reserves to 60.62 million ounces, or 1,885 tonnes, as trade tensions between the U.S. and the Asian giant continue to drag on. This puts it on course to overtake Russia and Kazakhstan, the top buyers of the yellow metal in 2018. China wasn’t alone, however. 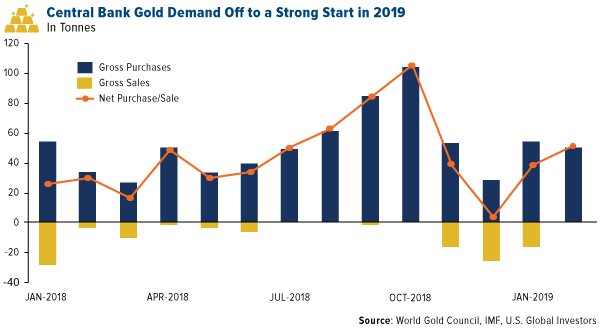 Global central banks bought a net 51 tonnes of gold in February, the largest monthly increase since October 2018, according to a recent report by the World Gold Council (WGC). Disclosure: I am/we are long GOLD, NEM, AUY, BTG, FNV, WPM, RGLD. I wrote this article myself, and it expresses my own opinions. I am not receiving compensation for it. I have no business relationship with any company whose stock is mentioned in this article. Additional disclosure: Holdings may change daily. Holdings are reported as of the most recent quarter-end. The following securities mentioned in the article were held by one or more accounts managed by U.S. Global Investors as of (03/31/2019): Barrick Gold Corp., Newmont Mining Corp., Yamana Gold Inc., B2Gold Corp., Franco-Nevada Corp., Wheaton Precious Metals Corp., Royal Gold Inc.
A real estate investment trust is a company that owns, and in most cases operates, income-producing real estate. REITs own many types of commercial real estate, ranging from office and apartment buildings to warehouses, hospitals, shopping centers, hotels and timberlands. Some REITs engage in financing real estate. The S&P 500 Stock Index is a widely recognized capitalization-weighted index of 500 common stock prices in U.S. companies.